The Savoy Cinema on Dublin's O'Connell Street. THE SAVOY CINEMA is hoping to subdivide its large screen one auditorium into “three to five” cinemas but insists the size of its flagship screen would remain the same. The Savoy Cinema is owned by the IMC Cinema group and rumours have long been swirling about the future of Savoy One, which has hosted many film premieres. In response to further reports about the future of Savoy One, IMC Cinema director Paul Ward confirmed that the group is looking at changing the iconic auditorium. He explained to TheJournal.ie that nothing is final at present as “planning issues” have halted any work from beginning but that changes are being considered. These changes would see Savoy One divided into a number of screens but Ward said that the exact number has yet to be decided, “it could be three, it could be five”, he said. 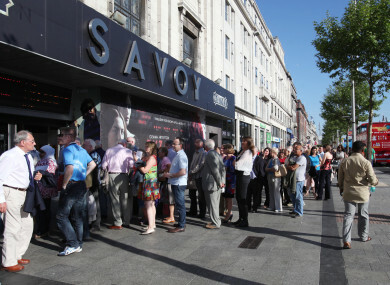 In January, IMC Cinemas said that the size of the Savoy One screen would not be affected by any changes and Ward has repeated that pledge. He added that patrons to the Savoy Cinema have been pleased with changes made to screen two and that they should be reassured that changes to screen one would be similarly successful. It is unknown exactly when work may begin on Savoy One but it will be operating as normal “for the moment”. Email “The Savoy's owners want to split the iconic Screen One into 'three to five' auditoriums”. Feedback on “The Savoy's owners want to split the iconic Screen One into 'three to five' auditoriums”.